Create easy access at the point of care. 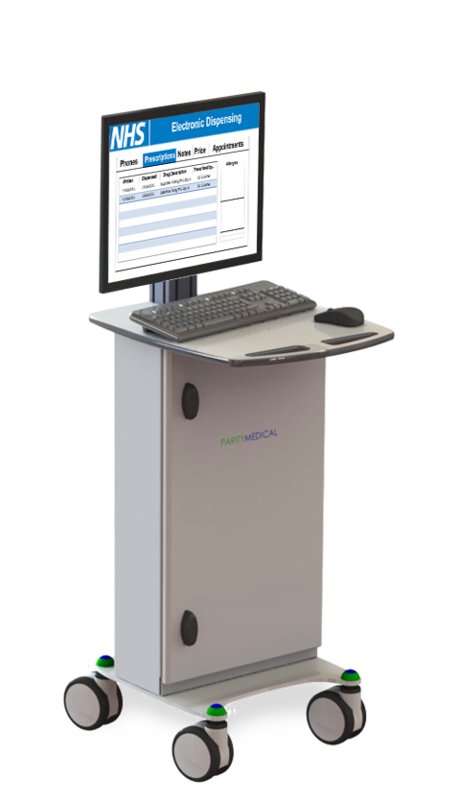 This Mobile Computer Cart is ideal for applications in areas where infection control is a top priority. It has a secure PC enclosure and is easily cleaned with standard hospital cleaning fluids. The display tilts, swivels and rotates for user viewing preference. It also has a long run time – over 8 hours, with a choice of optional power systems and a choice of work surface sizes. The Hygia Classic Single Screen Mobile Computer Cart is robust and durable, with a very small footprint. Perfect for use in Theatres, Wards and many other areas of the hospital. This Mobile Computer Cart can be configured with a wide range of accessories, including the following and many more.